Was awarded $1,500 by the arbitration board for injuries received in the fire, including burns to his ear and neck, an injured hand, and shock. Was awarded $2,250 by the arbitration board for injuries received in the fire, including a fractured coccyx, contusions to the back, shock and nervousness. 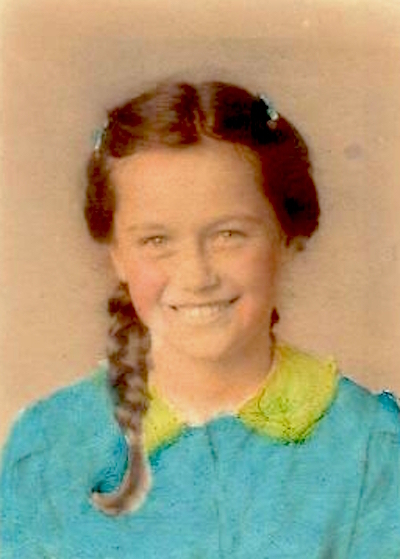 1940 photo of Diane MacRae, courtesy of her son, Dan Smith. 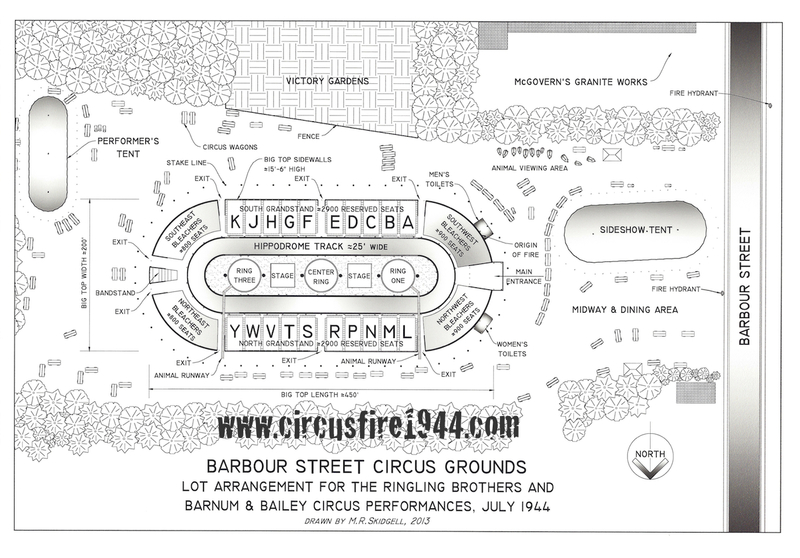 Attended the circus with her brother, Donald MacRae, and both escaped without injuries. Read their story here: Personal Accounts - Page 7. Attended the circus with his sister, Diane MacRae, and both escaped without injuries. Donald was photographed visiting patients in the hospital, and a photo of him with Mayor Mortensen was published in the newspaper. Donald passed away 02/17/2006. Read their story here: Personal Accounts - Page 7. Commended for her service during the fire. Went to the circus with his father, Edmond J. Mahar. Both survived. Jack was slightly burned on his knee. Went to the circus with his son, Jack E. Mahar. Both survived. Was awarded $1,750 by the arbitration board for injuries received in the fire, including burns to her arm, bruises, contusions, and shock. Attended circus with Rose Pantano and Donald Baggish. They escaped by sliding down to the back of the seats exiting under the tied down canvas. Charles Nelson Reilly was also with his friend Donald Baggish. Went to the circus with his 3 sisters, all survived without injuries. The Manning children sat next to the band in the bleacher section and were able to get out before the fire reached them. Mr. Manning is interviewed on the WWUH radio program, original air date 7/6/2004. Went to the circus with brother Tom and 2 other sisters. The Manning children sat next to the band in the bleacher section and were able to get out before the fire reached them. Tom Manning is interviewed on the WWUH radio program, original air date 7/6/2004. Sophie (Marcyoniak) Farley died February 24, 2019. Link to obituary / Back-up link. Attended the circus with her three children - Marie (9), Patricia (8) and Melanie Mascola (4), and Miss Greta DiBiasi (13). The group sat in the Southwest Bleachers, about three rows from the top, in about the center of the bleacher section. A man shouted "Look!" and she saw fire right above and in back of her, on the canvas roof and from about halfway up the canvas sidewall. The flames were about 4-feet wide, and Mrs. Mascola did not see any fire on the ground. She exited the tent by the Main Entrance with her youngest daughter, the path was crowded but she was able to walk right along. Her foot slipped thru the bleachers as she was leaving but she was ale to recover. Once outside, she went back in and her 8-year old was still seated in the bleachers, so she took her out the Main Entrance. The path this time was more crowded but the people kept moving. Mrs. Mascola's oldest daughter got herself out. Attended circus with her mother, Marcia McKinney Mason, and brother, Jarvis W. Mason. Only Marna would survive. Connecticut State Police officer. Was assigned to the State Armory on July 7th to assist those searching for family members among the deceased. Later in the evening, Officer Massicotte helped with loading the remaining unidentified bodies into trucks and then unloading them at the Hartford Hospital morgue. Connecticut State Police officer. Was assigned to the State Armory setting up cots and helping to remove the bodies from the trucks coming in from the fire scene. Officer Matus later helped people trying to identify the bodies at the morgue set up on the drill shed floor of the armory. Attended circus with his mother, Mrs. Mary Mazo, and his sister. Was in the third grade at Charles Wright Elementary School. Attended the circus with her son Eugene and daughter. Was awarded $300 by the arbitration board for injuries received in the fire, including nervous shock. Had been reported as missing, but did not go to the circus. Attended the circus with his cousins Gus Tierney and Tom Tierney, and friends Rosemary Collins and Brendan Preston. The group sat in the bleachers near the entrance, and all escaped unharmed. 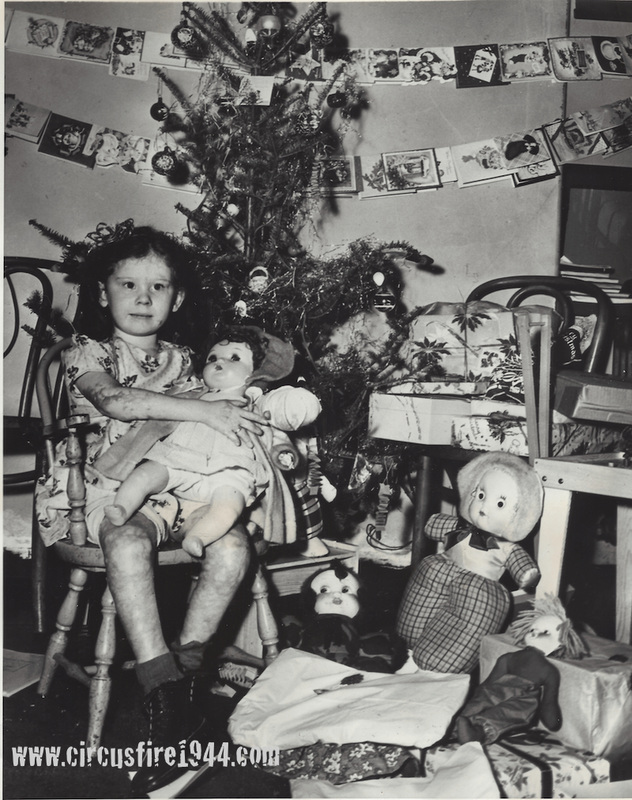 Read Mr. McCarthy’s story here: Personal Accounts - Page 8. Was awarded $7,500 by the arbitration board for injuries received in the fire. Attended the circus with her brother Martin McGrath and friends of the family. Was awarded $15,000 by the arbitration board for injuries received in the fire. Attended the circus with his sister Jane A. McGrath and friends of the family. Was awarded $5,000 by the arbitration board for injuries received in the fire, including a fractured pelvis, burns to her arm, neck, back and shoulders. Attended circus with her son, John. Both made their way to safety. Attended circus with his mother, Mrs. Harold Meah. Both made their way to safety. Mrs. Menard was working at Municipal Hospital after the fire, and spoke with a suspicious man who came in with an injured leg. See Mrs. Menard's Statement: An Uninvestigated Report About a Suspicious Man. Attended the circus with her aunt, Miss Marjorie R. Metcalf, who would die from her injuries. Attended circus with his father, Joseph Middleton, his grandfather Edson Ramsdell, his brother Joseph Middleton II and his sister Maryellen Middleton. They attended as a family group and walked there from the old Blue Hills Project. Everyone in the party escaped. Attended the circus with his children Edson John Middleton, Maryellen Middleton, and Joseph Middleton II, and their grandfather Edson Ramsdell. Everyone in the party escaped. 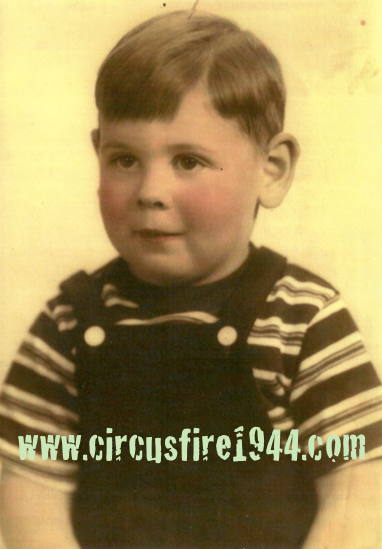 Attended circus with his father, Joseph Middleton, his grandfather Edson Ramsdell, his brother Edson John Middleton and his sister Maryellen Middleton. They attended as a family group and walked there from the old Blue Hills Project. Everyone in the party escaped. Attended circus with her father, Joseph Middleton, her grandfather Edson Ramsdell, and her brothers Edson John Middleton and Joseph Middleton II. They attended as a family group and walked there from the old Blue Hills Project. Everyone in the party escaped. Undated photo of Audrey Miles, courtesy of Reid Mariani. Attended the circus with siblings Willard and Monica Miles, and aunt Edith Walters. Audrey and Willard escaped under the side of the tent; Edith and Monica would die from injuries received. Undated photo of Billy Miles, courtesy of Reid Mariani. Attended the circus with his sisters Audrey and Monica Miles, and their aunt Edith Walters. Audrey and Willard escaped under the side of the tent; Edith and Monica would die from injuries received. Attended the circus with friend Carleton Lisk; the boys jumped from the top of the bleachers and ran to safety. Attended the circus with his son Lewis, entered the Big Top about 2:15pm and sat in the third row of the Southwest Bleachers, to the right next to reserved Section A. The animal act in Ring One had finished and Henry heard someone yell "Fire! ", and he saw fire on his left near the sidewall. The top was burning like a fuse and he thought it would smother itself out. When he saw the fire spreading quickly, he grabbed his son and left. The crowd was leaving in an orderly fashion out the Main Entrance. Formerly performed with RBB&B in the 20's and 30's. Went to circus with his son, Raymond. As father and son were exiting the flaming tent, Mr. Mills picked up Betty Lou Harmstedt and carried her to safety. Went to circus with his father, and they both survived. 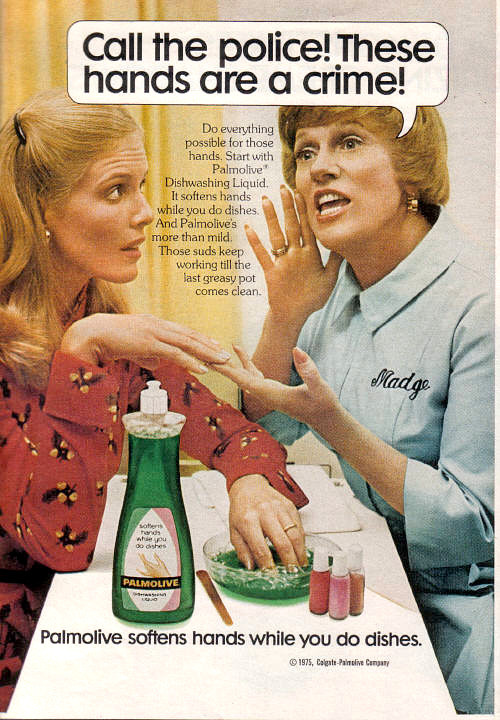 1976 magazine ad for Palmolive soap featuring Madge the manicurist. Actress on Broadway, radio and film, would become known as Madge the manicurist in the Palmolive soap ads and commercials. Jan helped chaperone a group of 16 children to the cicrus, and left the show early to prepare her broadcast (from NYT article; another report that said she left early due to feeling hot and stuffy inside the tent). Moments after she left the tent, it caught fire. Jan died Feb. 15, 2004 at age 86. 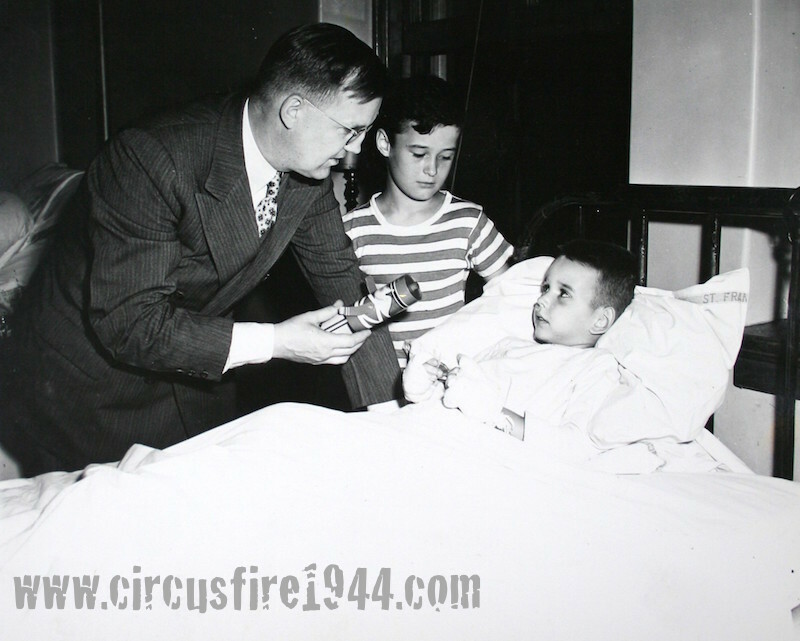 Joan was a survivor of the circus fire. Joan M. (Minicucci) Rivers passed away on January 9, 2019. Link to obituary / Back-up link. Attended the circus with her mother, Siri Montagna, and Helen Pagano and her son Nicholas J. Pagano. All in their party would survive without serious injury. Attended the circus with her daughter, Karen Montagna, and Helen Pagano and her son Nicholas J. Pagano. All in their party would survive without serious injury. Attended circus with family friend Michael Bailardo and unknown teenage girl friend. Attended circus with her aunt Mae Avery, cousin Sandra Avery, and grandmother Martha Moore. All would survive except Martha. Attended the circus with nephews Patrick DeMichele, Thomas DeMichele and Victor DeMichele. All got out safely through a slit in the tent side that someone made with his pocket knife. 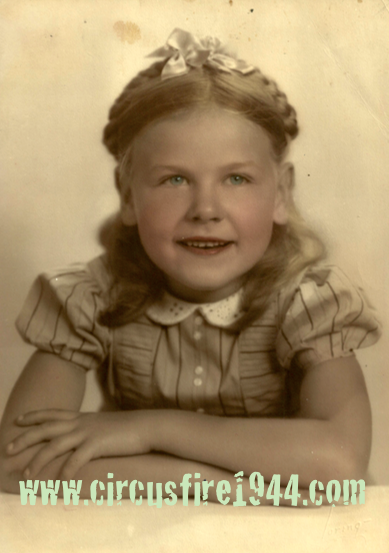 Ruth F. Morrell, 90, passed away peacefully Friday, November 19, 2010 (link to obituary). Divorced man, hadn't been home in years, has had many traveling jobs. Joined the RBBB circus during the 1944 season in Boston, had been with them on-and-off for 20 or more years. On the day of the fire, Mr. Morris was working as an usher between Sections M & N. There is an exit between these two sections, and he was standing in the exit when he heard someone yell. He looked to the southwest bleacher area and saw the fire. It was too late for him to help fight the fire, so he tried to keep the people from stampeding. Circus employee, hired as an usher a couple weeks earlier in New Haven for $23/week salary, minus $7 for room and board. George had plans to join the U.S. Army in August, and had received a pink slip. He wasn't supposed to be working on the day of the fire; he was taking his pink slip to the yellow ticket wagon to get his pay in full. George was in the back of the lot and saw people rushing out of the east exit next to the Bandstand, then he looked up and saw a huge sheet of flame at the far end, on the west side of the Big Top. George was with the show in Providence, and did not see any fires there or at any other shows since he was hired. Timothy jumped to safety and then pulled up one corner of the canvas and assisted about 25 persons to safety. Attended the circus with husband Dr. Lawrence Mucci, their son Larry, and friend Dolly and her son. Dr. Mucci calmly guided the group to the opposite end of the tent to a clear exit. Attended the circus with parents Gladys and Dr. Lawrence Mucci, and friend Dolly and her son. Dr. Mucci calmly guided the group to the opposite end of the tent to a clear exit. Attended the circus with wife Gladys Mucci, their son Larry, and friend Dolly and her son. Dr. Mucci calmly guided the group to the opposite end of the tent to a clear exit. Attended the circus with her parents, Walter D. and Hortense Murphy, and brother Charles, and with the Berube's, Anne and Esther. All but Esther Berube and Patricia would die from injuries received in the fire.